It’s hard to say no. We often feel a sense of obligation and don’t want to offend anyone, or maybe we just feel bad. We don’t want to disappoint people. But it’s not enough just to say no for the sake of saying no. In this episode, we look at the deeper reasons for saying yes. When we say no to one thing, we essentially give ourselves the credits to say yes to another. What do you want to say yes to that you’re not able to say yes to right now? What is it worth saying no to? 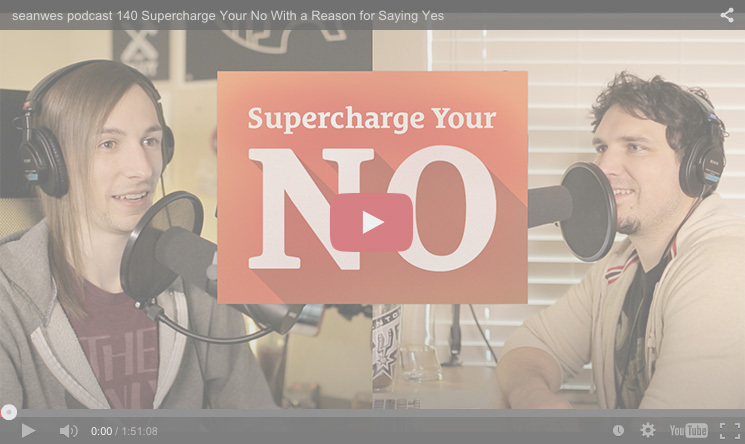 We discuss why we’re afraid to say no, how to say no, when to say no, and what your yes is. What things do you need to say no to? What people to do you need to say no to? What opportunities do you need to say no to? 02:44 Ben: I struggle with saying no, not only to other people, things, and opportunities, but to my own ideas. 03:13 Sean: Why don’t we say no—at least, as often as we should? 03:35 Ben: I don’t say no sometimes because I’m a generous person and I feel like saying no goes against that. Sometimes, I feel indebted to somebody because of a gift or kindness they’ve shown me. 04:13 Sean: Part of it might be you don’t want to offend someone. “No” is seen as a negative or mean thing and you don’t want to disappoint anyone. 04:45 Ben: Before I consciously started working on saying no, I would look for opportunities to say yes because I wanted people to feel happy with me. The problem with that is people will take you up on it without consideration for how taxing that is for you. It’s not others’ responsibility to know what you can take on. No matter what you do, you’re going to disappoint someone. Do you want to disappoint other people, or do you want to disappoint the future version of yourself? 07:01 Later on, you could be disappointed in yourself for saying yes because you now don’t have the availability to be at your kid’s recital or ballgame. 07:24 Ben: For someone who’s a people pleaser, the fear of disappointing yourself is still less than the fear of disappointing other people. In fact, you’re probably going to disappoint more people than you are going to make happy. If your desire is to please people, you won’t be able to do that for everybody, and you’re definitely not going to be able to do it for the small group of people that matter. 08:29 Sean: That emphasizes the importance of who you’re trying to please. If you’re going to disappoint someone and if you’re going to disappoint more people than you make happy, who are the people that you’re trying to please? Who are the people that are important to you? How are you setting yourself up to be able to make those people happy? Otherwise, I think you can get caught up in people-pleasing and worrying about other peoples’ disappointment when you say no. It could potentially keep you from making the people that matter in your life happy. 09:16 Ben: This reminds me of how you treat your potential audience when you’re growing an audience (Related: e092 4 Keys to Growing an Audience When You Feel Like You’re Not Getting Recognition). It’s important to focus on how your message speaks to a single person instead of thinking about it in a broad sense. If you want to do it right, then you want to provide a meaningful experience for an individual. Is the way this relationship is set up working? Am I getting paid enough? Is the process we’re going through how I want to work? If not, is there a way to turn this into the ideal kind of client relationship? 12:17 Do that if you can—it may mean charging more. If you can’t, what will help you detach yourself from the fear of saying no to that relationship is thinking about your ideal client. Do you want the clients that pay you what you’re worth and go through your professional process enough to say no to the clients that aren’t ideal? You can’t say yes to the ideal clients, if you never say no to the wrong ones. 13:07 Ben: Even if you’re working with your ideal clients, there are still goals and aspirations you want to grow towards. Your clients are benefiting from where you are today but if they want to benefit from where you’re going, they have to follow you. 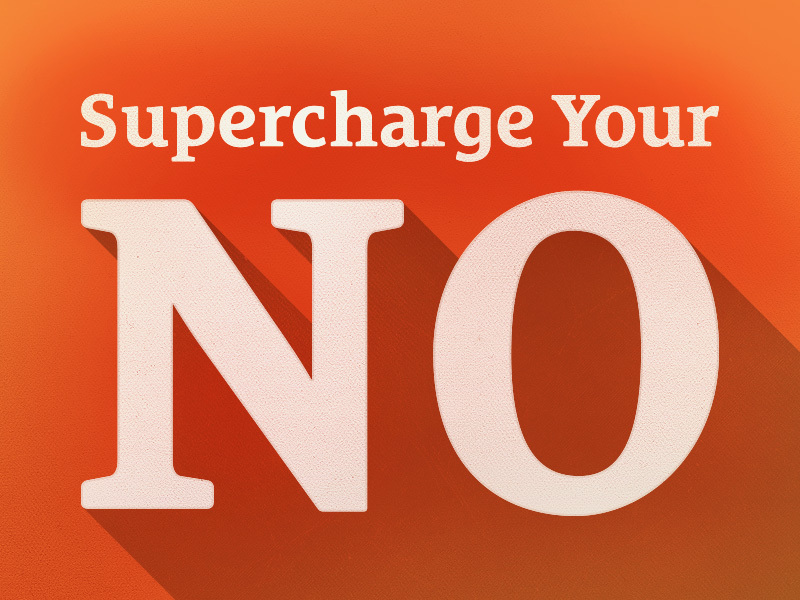 Saying no is your tool for creating time. 15:06 How do you say no to someone you’ve worked with a long time? How do you say no to someone who is used to hearing yes from you? How do you say no to someone who is willing to pay, but it’s the wrong circumstances? 15:58 Sean: It’s a matter of reframing. There’s this underlying assumption that you say no just for the sake of saying no. We don’t say no just for fun, we do it so we can say yes to the things that matter and are important. If we get caught up in saying no for the sake of it, it feels difficult. Why am I saying no to this client? So I can say yes to the ideal client. Why am I saying no to this good opportunity? So I can say yes to this great opportunity or so I can spend time with my family. I have to say no so that I can say yes. 17:21 Ben: You don’t owe anyone the explanation of saying no so you can say yes to other things, but you definitely owe it to yourself to give yourself a reason to say no. 17:43 Sean: I find it difficult not to give the other person a reason or justification for saying no. Once you go down that path, you can be tempted to give reasons that sound good but are not your true reasons. 18:00 Ben: You’re also opening it up to their subjective ideas about your reasons. 18:05 Sean: Yes, and if, from their perspective, those reasons change or those objections are mitigated, then they might think you’re available to do it. 23:16 The obvious answer for how to say no is, “Say the word ‘no,'” but maybe it’s not so simple. 23:44 Ben: Maybe it should be simple and we’re overcomplicating it. Make sure to be professional and think about how your brand is coming through in the way you say no. Don’t think about how convenient or inconvenient it’s going to be for the other person—ultimately, they’re responsible for that. 24:38 The hard thing about saying no sometimes is you feel like you’ll be leaving them in a bind. If you have a commitment to them, fulfill it, but if you don’t have a commitment, make it clear in the beginning that if and when things change, you’ll need to move on. 25:56 Sean: You’ve got to say no for yourself because you have to think about the quality of your yes. What does it mean when you say yes to something? The more things you say yes to, the less weight it carries. 30:04 Ben: I just wanted to clarify: I’m not saying you shouldn’t care about the person you say no to. I’m saying you shouldn’t allow how they may feel or what they might think to ultimately influence your decision. Imagine saying yes and immediately assess how you feel in your gut. Am I spending enough time with my spouse? Am I spending enough time with my kids? Am I spending enough time to be healthy as a person (physically, mentally, spiritually)? Am I giving myself enough margin? 32:43 Ben: What matters to you is what will help you be the best version of yourself for the opportunity you say yes to. Just like with scheduling margin (Related: e055 Preserving Your Sanity by Creating Margin), you need to treat the things that matter to you as if they bear a lot of weight. 34:17 Sean: People think of margin as a luxury they don’t have time for, but what are you doing to create that time? I don’t take a Small Scale Sabbatical every 7 weeks because I have the time, I make the time by saying no to everything else. If we treat margin as a luxury, it’s never going to appear—we fill time by habit. 34:49 Margin has to be seen as a necessity for your own sanity. Put your family time on your calendar. If you want to say yes to something else during that family time, then you have to shorten that scheduled calendar event. It almost has to be a physical thing for us to feel the effects of chipping away at that time. 35:57 Ben: That’s a great way to make it tangible. It’s one thing to say that your family and your physical health are important to you, but if you’re not making time for those things, it’s rare that they will randomly happen. If you would have to physically delete, adjust, or move the time you had scheduled for your important things on your calendar in order to accommodate another person asking for your time, the decision should be easier to make. 37:17 Sean: Whenever I go on a date with Laci, I put it on the calendar because it makes it more of a commitment. It’s not free time when I was going to try to spend time with my spouse, it’s allocated time. It makes it more obvious that you would need to say no to that important thing in order to say yes to something else. 38:04 Ben: As a mental exercise, make a list of what matters to you in order of importance and color code them on your calendar. That way, you wouldn’t even have to read the event title—you would know that time was off-limits by the color. 39:36 Sean: It’s difficult to figure out how to say no in the right way. Saying no, and doing it pragmatically, takes emotion. If you ever find yourself investing a lot in writing a “no” response to a requesting client, save that as a boilerplate response you can reuse in the future. That way you don’t have to go through the emotional decision of whether or not to say yes to a job. 40:33 Ben: That can be super powerful. In your “no” to them, if you can express that you can offer your best service and quality to someone that you can say yes to, that speaks volumes to your brand. If you communicate it in the right way, they might have so much respect for your decision to say no, that they come back to you once they’re in a better position to do business with you. 41:56 Sean: That’s so true and it’s just as applicable in the personal angle, like with your friends and family. Saying no might seem to come across negatively at first, but over time, they’ll see that you’re saying no so you can say yes in the times that matter. They’ll realize the weight of your yes. It makes your yes so much more important. When you give your endorsement weight, it’s invaluable. It’s not about being a “no person,” or a “yes person,” it’s about being a quality person. 45:56 Ben: It’s not about finding the right balance between yeses and nos, it’s about having your yes really mean something. When you can say yes, you want it to be the best yes you can possibly give. No is not the goal, it’s a tool to help make the best yes happen. What are the things you can’t say yes to right now that you want to say yes to? What do you need to say no to first in order to enable to your yes? How much do you care about the quality of your yes?